Von Lieven, Prince Sigismund Sergus (1870-1937), was born a nobleman in Lievenhof, East Prussia (Germany) of a Russian father and a French mother. He graduated with a PhD. in Linguistics from the University of Königsberg. He first immigrated to America in 1895 and finally settled in 1900. In 1909 he married Margaret, a native of Northern Ireland. He worked as a real estate broker. His address from 1917-1922: 1956 Bathgate Avenue, Bronx, New York. His address in 1927: Broadway, New York, New York. In 1930 his address was 1925 Harrison Avenue, New York, New York. The family estate in Lievenhof was confiscated during the revolt in 1918 with his family retiring to a house they retained in Königsberg. During the 1929 crash Prince Von Lieven lost $250,000 in real estate holdings and cash and became employed as a translator at Columbia University for Education tracts funded by the W. P.A. In 1936, he was involved in a lawsuit with the Trust Company of New Jersey. He collected ancient and modern Gold and Silver Coins. A Member of the New York Numismatic Club since 1917 he became a Life Member in January 1922. He became ANA member No. 2014, in 1919. Correspondent and buyer with Henry Chapman. He attended the Thomas L. Elder Dinner in New York on February 23, 1921. His coin collection was sold posthumously by Thomas Elder on May 13-15, 1937 together with that of Dr. Clifton Wheeler, George Ross et alia. Several of the Gold coin lots, including Lot 975 a Brilliant Uncirculated 1880 $3 Gold piece most probably were that of Von Lieven. Fig. 1. 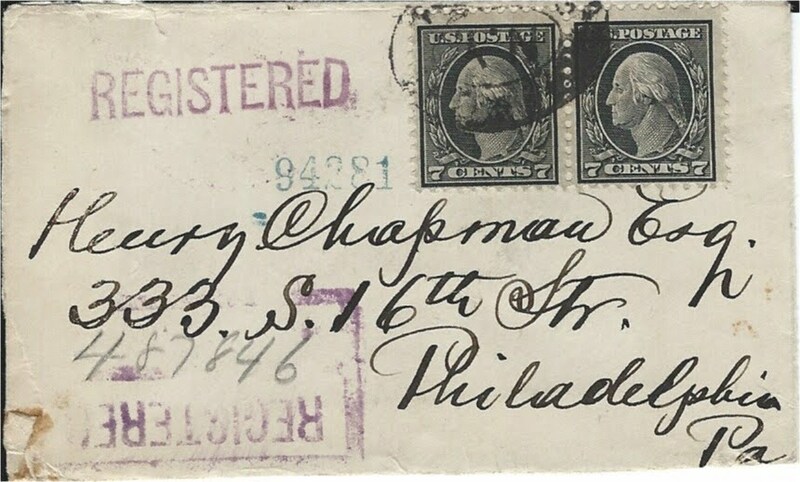 Registered Letter sent by Sigismund S. Von Lieven to Henry Chapman on January 11, 1922 and franked with a strip of two Scott# 469 (very scarce). Courtesy the Lupia Numismatic Library, Special Collection, The Chapman Family Archive. Fig. 2. 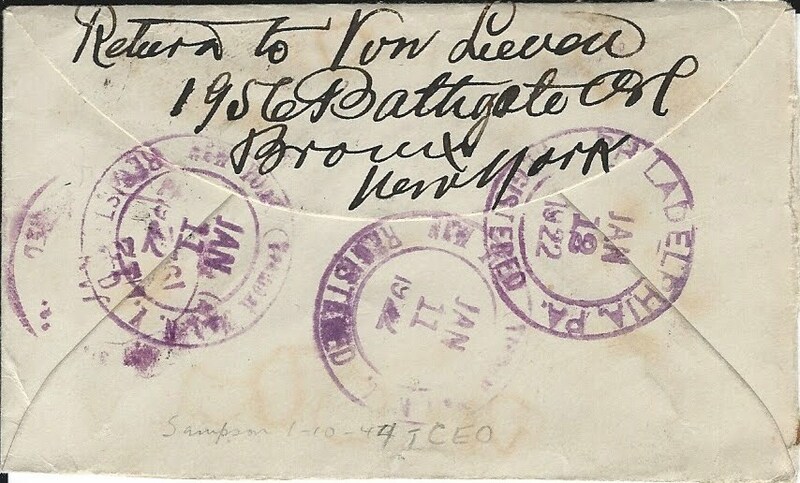 Reverse of the envelope in Fig. 1 showing the signature of Prince Von Lieven. He died on January 20, 1937 at Manhattan, New York. Thomas L. Elder, 281st Sale, May 13-15, 1937, 94 pages, 2055 lots. Adams rating A.